If you have always wanted your kids to have the Youthfront camp experience without staying overnight, now you can! 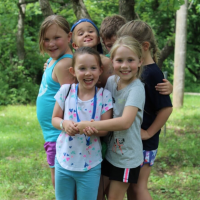 Youthfront Day Camp offers 1st-5th grade children the opportunity to have fun with friends and discover God’s love for them through transformative activities, all while sleeping in the comfort of their own bed throughout the week. This experience includes our popular camp attractions, such as the Splash Park, climbing wall, zip line, Blob, pool & waterslide, and more. Campers begin their day at 8 am accompanied by caring adults leading programmed activities as they travel from southern Overland Park to Youthfront Camp LaCygne and arrive back at 5 pm. And here’s the best part: they will have so much fun! Call us at 913-262-3900 and we will be happy to answer any questions you may have! Our most popular Youthfront Camp attractions are available for Day Camp! We believe God has blessed us with one of the finest camping ministries in the country because of our incredible and dedicated staff. Our full-time staff have decades of camp experience as they create the best possible program along with hiring high quality Summer Staff. Our Summer Staff are college-age people who genuinely care about kids and facilitate our camp program. We conduct extensive interviews and background checks for all of our staff hired to make sure that your campers have the most capable and trustworthy leaders during their session of camp. We have one staff member to every 5 campers for Day Camp, so you can rest assured that your child will be cared for at all times. We will start each day meeting parents and children at the collection point for our transportation to / from Youthfront Camp LaCygne. During our time on the bus, campers will have fun connecting with the person sitting next to them. Campers arrive at Youthfront Camp LaCygne and get ready for the day. Day Campers get to start the day off with either some time at the pool and water slide or at our lake attractions. Day Campers will enjoy lunch together (optional meal plan available). A large group experience to help campers experience God’s love and grace in a personal way through fun songs, skits, games, and engaging storytelling. Campers meet in small groups to ask questions, share stories, and talk together about faith, God, and loving one another. Campers spend the afternoon rotating through a variety of fun activities such as playing blacklight dodgeball, going to the Snack Shack, watching a video, and exploring our beautiful camp! During this time on the bus, we will review the day and have fun friendship-building activities. Parents meet the buses to pick up their camper. Where is Youthfront Camp LaCygne? Youthfront Camp LaCygne is approximately 40 miles south of Kansas City (22626 E 2400 Rd, Lacygne, KS 66040). You can find us on a map here. What should my child bring to day camp? In the spring, we will post a document to your camper account with more details about how to prepare for camp including what to bring. We will send you an email to let you know when this is available! You can sign up for as many sessions of day camp as you would like for your children to attend. While the theme will be the same each week, they are sure to have a great time in community and experiencing the camp attractions for another session. Also, the experiences they have in prayer and Scripture will be fresh no matter how many times they experience them. The price of camp does not include meals. However, you may purchase a meal plan (this option will be available in the spring). If you choose not to purchase a meal plan, please send your camper with a sack lunch. Where is the drop-off/pick-up location? Daily transportation is provided for Day Camp from the Christ Lutheran parking lot (11720 Nieman Rd, Overland Park, KS 66210). Parents may drop off their camper(s) between 7:45 and 8:15am. The bus will arrive back at this location around 4:45pm.